This book is much like the author's earlier book, Let It Fall. 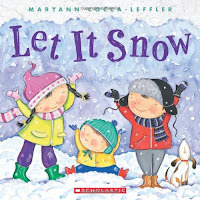 It follows the same family and the three siblings as they journey through the winter season together - from snow days, to snow forts, snuggling under blankets. The illustrations are very vibrant and colorful. The illustrations are amazing. 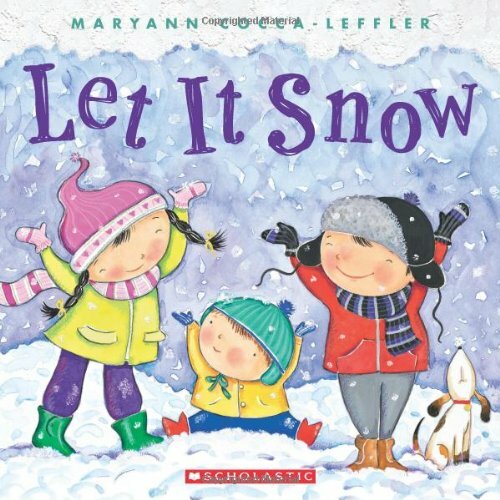 After reading the book, my daughter wanted it to snow so she could do some of the stuff in the book. It ends with spring coming, Let It Rain! So I assume we have more to look forward to soon. This board book for young readers has bubble illustrations for each of the planets and counts down from 8 to 1 planet, starting closest to the sun and moving out. 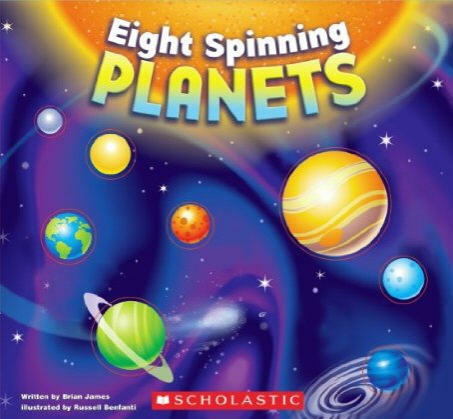 Each page has a short description about the specific planet being profiled. It is very bright and vibrant - the colors are wonderful. My only problem is a factual error at the end of the book. It states Pluto is not a planet because it is too small. Though it was recently demoted from being a planet, it was not related to its size but because of its orbit. This misrepresentation or misinformation causes the book to lose some of its luster. This book was a wonderful surprise. With bright vibrant illustrations of people instead of photos, the pictures just pop out of the page. The style is different and wonderful. Mo Willems has written this book as the third and final Knuffle Bunny book. It was the first that we had encountered. As a family we are very glad that we did. 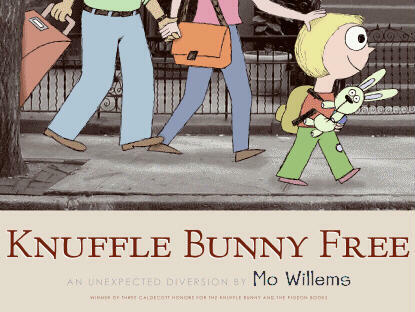 This is the story of Trixi's trip to Holland to visit Oma and Opa, but she forgets her Knuffle Bunny on the airplane. But maybe she will grow up a little though this experience. The story is wonderful and the illustrations are amazing. 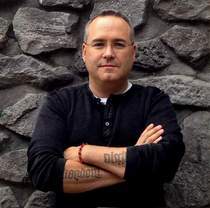 ND Wilson, is a man who wears many hats, he is an editor, an author, a screenwriter, professor, a husband, a father and more. He took some time out of his busy schedule to answer 20 questions for Book Reviews and More. Nathan David Wilson has accomplished a lot in 32 years here on earth. He has written a bestselling trilogy for young adults the 100 Cupboards, authored 2 books for young children, written a parody of the Left behind series, and has now been tapped to be the screenwriter for a film adaptation of C.S. Lewis's A Great Divorce. 1. You seem to have a knack for stirring things up, either with your replica of the Shroud of Turin or your parody of the left behind books. Do you stir the pot intentionally or is it something that just happens based on your nature? I've asked myself this question more than a few times, and I'm not sure I can give a good answer. I think trouble-making is a bit in my bones, but then it's not something that I always lean against (though, I occasionally do, I promise). So let's go with 'all of the above'. It's in me, but I cut with that grain. 2. In your book Leepike Ridge you present an alternate view of history and colonization of North America. Those theories are on the outside of conventional wisdom, but in propagating them through fiction you can lay the ground work for readers question what they have been taught. What was your favorite part about writing this book? My favorite part of writing Leepike, was simply how ready the story was to come out. The opening line grabbed me late one night (when I was supposed to be writing something else) and I started teasing it out, trying to discover where that opening line led. It was like pulling old bubble gum out of a crack in a dam. Three and half weeks later, I had a complete first draft. But to get back to the alternate history question, that's just a subject that I've stewed on for a long time. We moderns have a remarkably low view of ancient man (thanks to Darwin). And we like to hum and plug our ears when we come across signs that ancient man was actually quite impressive-frequently doing a great deal more than we do, and doing it with a great deal less. I, frankly, wouldn't be too surprised if our astronauts stepped onto the moon next to a rock with 'Gilgamesh was here' scratched on it. 3. Has Leepike Ridge been optioned to be a film? If not has there been any interest? Leepike has been optioned, but I let the option expire. I still have hopes for it, but it's definitely not on the front burner at the moment. Ha. Trick question. I don't. But what I do achieve, I do with the assistance of my lovely wife (and caffeine). Hmm. I'm usually hesitant to criticize a fellow author-don't want to get into a spat with anyone. But in this case, I think Collins has every right to be secure in her success. My thoughts won't spoil anything for her. So, here they are, nutshelled: The quote you cite is only about the first book. I actually haven't finished the trilogy. And she really can write an effective page-turner. At the same time, I thought that the author's judgments were morally confused, that she didn't actually understand what turns a culture, what ignites rebellion, or what true subversion of an evil paradigm looks like, and she glazed over the hard and bloody decisions the hero made with a glossy (implied) self-defense plea (that was a bit weak). Then the threads drifted into odd love-triangle, reality-show goofiness. But, regardless of the taste the first two stories left in my mouth, I still learned a great deal from her on a craft-competence level. Woof. It's been a little different with each book. Leepike, the whole thing was written before it was purchased. But the 100 Cupboards trilogy was sold based on a first draft of Book 1, and a one-page summary of the next two. More recently, I signed a five book series (again with Random House) based solely a three-page synopsis. As for the writing itself, I start with a broad (usually five-point) outline of a book idea. Then I work on getting a really strong first page before growing into that first chapter. From there, I develop small three to five point outlines of each chapter as I write them, making sure they each serve the broader narrative. Once I'm through that first draft (3-4 months is normal), it heads off to my editor (terrific guy-I've been working with him since Leepike). He marks things up, I mark things up, I work up a next draft. Rinse and repeat. We'll keep doing that till we're both happy. Oh, yeah. Absolutely. I actually wrote Leepike to Coldplay's "X&Y", because it had just come out and I knew I couldn't be distracted by the lyrics. But I've gotten better at working with music since then, and I tend to assemble a general playlist or a broader feel for every project. I just wrapped up the second draft of a script, and so far I've listened through the entirety of Handel's Messiah about 75 times while working on it. As I hit the final revision (a pretty light one), I'll click play again, and do a few more laps. (FYI: I'm listening to the 1751 version by the New College Choir, Oxford). 8. If you had not become a writer what do you think you would be doing for a living? Then I would be currently involved in trying to become a writer (or writing without pay). The only question for me was always whether or not I would succeed as a writer, not whether I would write. But if the writing wasn't paying bills, I might be teaching full-time or I might be building/designing. I can't really avoid that kind of thing-I love to envision and then build. When my family and I are strolling through neighborhoods, I can't look at houses without mentally taking them apart and adding on or shifting (and occasionally bull-dozing). I bought the house we currently live in because it was across the street and I thought I might be able to add an entire story to the top of it-which we since have). I really do approach stories in a similar way. I love the artistry of expression, but I also love to build. On all of those goofy personality tests, I always get tagged as an inventor, never as an artist. 9. What was your favorite book to write and why? Don't know that I can answer that one. They've all brought their own unique ups and downs. Don't ask me which is my favorite kid either . . .
10. Are there any plans to translate any of your books into other languages? If so what books and the timeline? The 100 Cupboards series has now sold into well over (I believe) twenty countries. In some, it is just releasing, in others, Dandelion Fire is already out. My kids love looking at the Japanese versions especially. I hadn't really thought about that side of things when I first started writing, but now I'm almost always in correspondence with one translator or another, explaining baseball idioms or expressions unique to the books. I've discovered that I'm a rough one to translate because I like to . . . depart . . . from standard usage. And when I resort to idioms and slang, I tend to riff on them more than I use them in a 'Dictionary of American Slang' sense. 11. Your two books in the old Time Stories (The Dragon and the Garden, In The Time of Noah) series both reference a third book The Sword of Abraham. Are you still hoping to get it published? Yeah, there have been some issues there, but I actually want to do piles and piles of those books. Not because they're hot sellers (they aren't), but because I want to tell my kids those stories in that voice and style (rather than in the more traditional, cartoony way). 12. What are your favorite books to read with your children? Currently trudging through "The Lord of the Rings". Love it. Love watching them love it. Waiting patiently until the right moment (a few years from now), when I can read them That Hideous Strength. That, preemptively, is my favorite book to read them. 13. What were your favorite books and authors to read as a youth? Shockingly, C.S. Lewis, J.R.R. Tolkien, P.G. Wodehouse, G.K. Chesterton. And that's chronological-youngest introduction to oldest. Loved them all. Love them all. There are a lot of others that I enjoyed, but those are the authors that shaped me and set the bar in my head for how a thing should be said, how a story should be told, and even how a thought should be thunk. Ha. See above. Of course, I have branched out (I like Tom Wolfe and P.D. James, to name two), but very few have yet impacted me as much as those early fellas. Flannery O'Connor is definitely on my short list, and Annie Dillard's earlier stuff is top notch. 15. There are rumors of a new series written by you, The Ashtown Burials? Yes, there are. And those rumors are true. The first book is finished and in copy editing. I like it a whole heap. 16. Being the author chosen to do the screen play for C.S. Lewis's The Great Divorce must be both an honour and a fair amount of pressure. For no matter how you interpret it there will be fans and detractors. Can you tell us a little about the process of adapting someone else's book? Well, I'm still learning that process. I'll be able to tell you more once I'm done. But, obviously, I want whatever I do to honor Lewis's vision, and impact people in the same way that he wanted to impact them with the book. I'll be doing my best, let's put it that way. And I'll also be applying the golden rule-easier to bear in mind while someone else is adapting 100 Cupboards. 17. What are your some of your favorite movies? I'll throw out some ranging shots (incomplete random list) with no explanation, justification, or apology: Slumdog Millionaire, Stranger than Fiction, The Queen, Gladiator, Damn United, Brazil (director's cut), Monty Python and the Quest for the Holy Grail, Braveheart. What the heck, I'll even throw How to Train Your Dragon. 18. You have signed a deal to bring your 100 Cupboards series to the big screen; will it be a trilogy of films? I've signed an option on all three books. The first one is still in development, but I assume that whether it is a trilogy of films will depend on how well numero uno does. So here's hoping that it makes it all the way through production and into a friendly box office. Do, don't talk. Work your tail off trying to become as good as you can possibly be. Cream will rise, so become cream. Too many bright Potentials spend their days hoping something will fall into their laps. Know that the world wants art, that publishers want good books, and then go get good. Sustained, patient diligence is a powerful cocktail.Oh, and don't ever get hurt by criticism. It's your friend. With so much accomplished and much more to come, I for one look forward to reading more books by Mr. Wilson and thank him again for taking the time to answer some questions. This is the third book by Canadian author Sharlene Weingart. 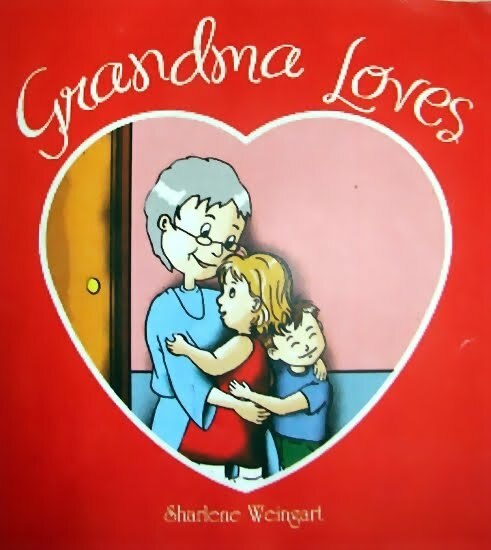 Her books are very popular with our children and currently among their favorites. 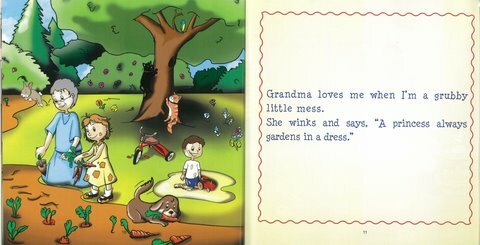 The style is similar to Mommy Takes Away, with facing pages of text and pictures, but with the pictures on the left and text on the right. 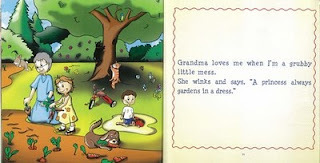 Written in rhyme, the book follows a young girl and her brother as they spend a day with Grandma. This story goes from combing hair, to making soup, playtime, a walk and time gardening, picking flowers, making cookies and story time. 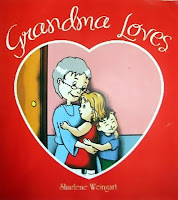 It is all about Grandma-time and loving grandma. 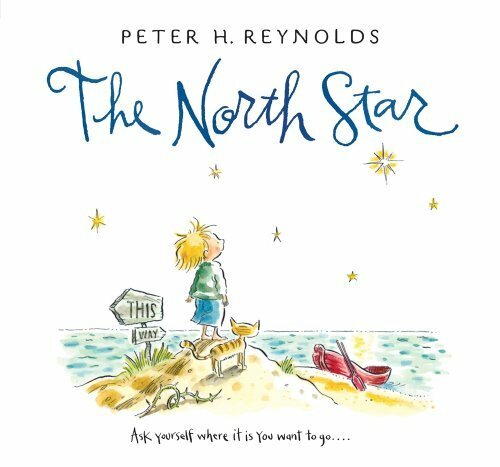 Wonderfully illustrated and well written, children will ask to have this book read to them again and again. This new re-telling of the fairy tale that we are all familiar with is both charming and entertaining. The illustrations are wonderful and every page has at least one flap to open to reveal a changed image. 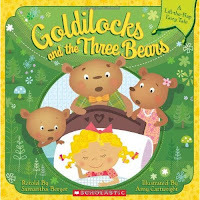 In this re-telling, Goldilocks actually learns her lesson. It is a fun little book that young readers will enjoy again and again. Sam is preparing for the holidays, decorating his Christmas tree and polishing his Menorah. 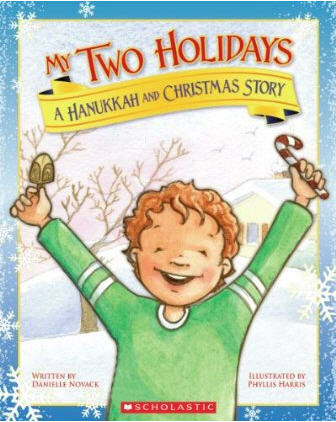 But at school as child after child shares their story about their holiday tradition, Sam becomes confused and embarrassed, because all the other children only have one holiday and he has two. That night he shares what happened to with his mother, and she explains that his family celebrates two traditions. The next day at school Sam shares about having two traditions and the other kids think that is cool. The book is wonderfully written and charmingly illustrated. It presents both traditions with respect and appreciation. It will be a good book to help your children understand another tradition or maybe their own mixed traditions. This is the second book by Leonid Gore we have read as a family. Both are greatly enjoyed by my children. 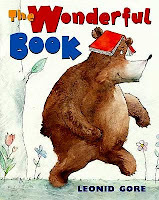 One sunny day a book is left in the forest; it is found and used by a rabbit, a bear, a family of mice, a fox and a worm. Then it is found by a boy and as he reads the story, the animals come out to listen to the wonderful book. 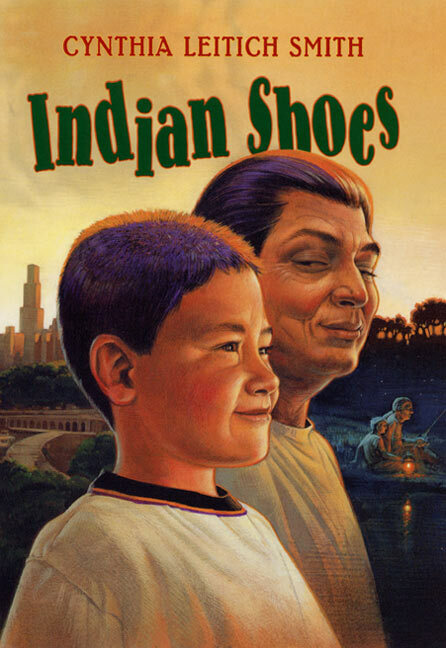 It is a great story and wonderfully illustrated. 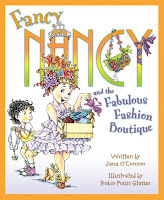 With each new Fancy Nancy novel my daughter's vocabulary grows, but so does her desire to play dress up and be attired in fancy outfits. 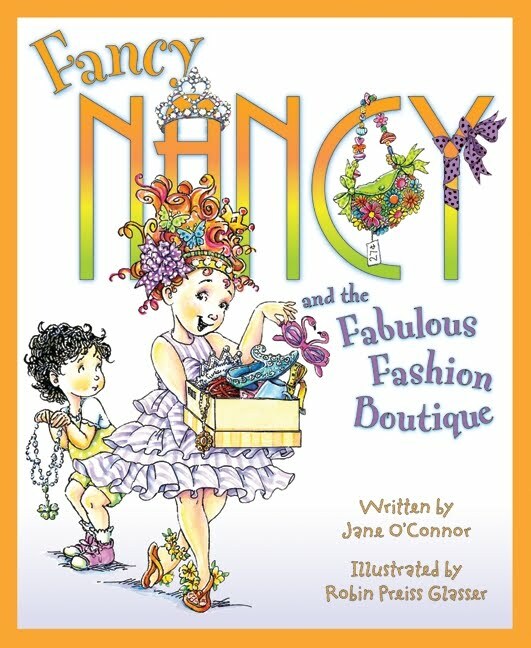 In this story Fancy Nancy is trying to save up money for a new fan she wants. She decides to open a Fashion Boutique, and she is selling some of her old accessories and outfits to raise the money she needs. She is also helping prepare for her little sister's birthday party. Nancy steps up in this one and rises up to the occasion to help rescue her sister's birthday party from being rained out. This is another great story in an incredible series. From stories about pants not being delivered with a tux for a wedding, to a Christmas menagerie, these stories will be fun to read as a family again and again. You will find yourself rooting for Ray, and surprised by his grandfather's kindness, gentleness and ingenuity in solving problems and making things right. 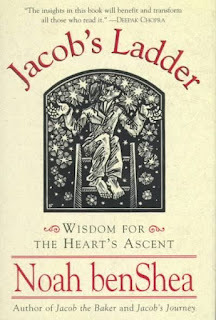 It is a wonderful book by an amazing author. Siobhan Vivian, born in New York City but raised in Rutherford, NJ. She attended the University of the Arts and graduated with a degree in film writing. She has an MFA in Creative writing Children's Literature from The New School University. Besides writing amazing novels she also teaches Writing Youth Literature at the University of Pittsburg. 1. Your first university degree was in writing, as was your second and now you teach writing, when did you know you wanted to be a writer? I always knew I wanted to be an entertainer of some sort. I was definitely the loud girl, the one who was constantly talking out of turn, gossiping and making jokes. But it didn't strike me until my senior year of high school, when I enrolled in a creative writing elective, that writing was something you could study in college. That's when it all came together for me. 2. 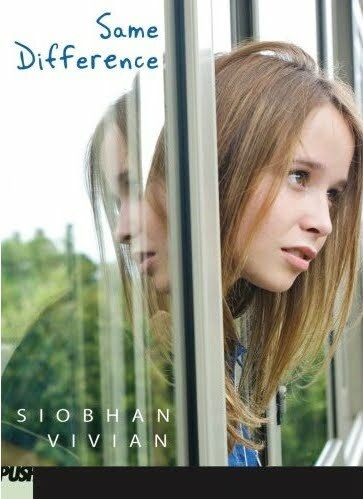 Siobhan is a Irish form of Joan, your female characters seem to be variations on Joan of Arc, or at least to the extent that you write strong convincing female leads who all seem to go through a personal challenge, is that intentional? Wow! I never noticed that before. But I am attracted to stories about girls growing and challenging themselves…now it all makes sense! To be honest, I didn't read much in high school beyond what was assigned for class. But I did enroll in a Great Books class, and loved everything that was put in front of me. But it wasn't until college when reading became something I liked to do for pleasure. I had to read Rabbit, Run by John Updike for a class, and promptly became obsessed with that character. I would often blow off studying or writing so I could read my way through the Rabbit novels. 4. 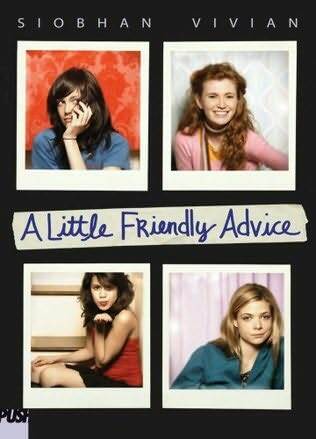 What were your favorite books as a teen? In my early teens, I read a lot of 80's romance / horror books. The ones with the illustrated covers, where a girl goes to prom and her boyfriend dies and she needs to figure out who killed him. That sort of thing. 5. What are your favorite authors now? I am a devotee of Melissa Bank. I've been lucky enough to have a multi-book contract with Scholastic, as well as an editor who trusts me. So I will come up with an idea, pitch him a bit of a synopsis over lunch or something, and then get the official Thumbs Up to start the book. 7. How many drafts or major revisions are part of your writing process, and what is your goal or timeline for each? It really depends on the book, but I typically take about 15 to 16 months to complete one novel. I might do two draft or ten drafts within that time frame. 8. You now teach writing, what was it like making the transition from student of the craft to teacher? It wasn't too hard. I absolutely LOVE the work-shopping process, and I also have worked as an editor, so it was a pretty natural fit to step into that role. 9. What is the most important lesson you try to impart to your students? To not get bogged down in the idea of "perfection" during a first draft. You can easily waste a good six months rewriting a first chapter that will probably get cut out completely once you actually write the book from start to finish and figure out the trajectory. For me, it's rare if an old character pops into my head. I tend to give everything I have during the writing time, and then let them go off into the sunset once I hit The End. 11. Your books are written and published for teenagers, yet I discovered them from an adult reviewer and know many adults that love them, your books seem to really transcend that category, were they written to achieve that or was it just fortuitous to work out that way? That is such a nice compliment. I think it boils down to this-a good story is a good story. I can remember being read to by my mom, and how we were both completely entranced by A Wrinkle In Time or Trumpeter of the Swan. I think a good story has the power to transcend its intended audience. 12. Your books are also marketed mainly to girls and women and yet I have read them and recommended them too many friends of the male gender who loved them. Do you see yourself writing a book aimed at a male audience? Much like Laurie Halse Anderson's Twisted? That's excellent. I'd love to attempt something like that in the future. 13. 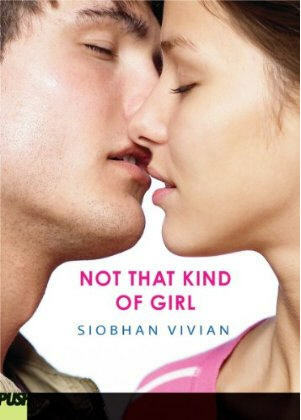 When you wrote Not That Kind of Girl, what came first the title or the story line? The story line. Actually, the idea came almost fully formed to me after I had the chance to sit down and speak with a girl during a high school visit I did in New Jersey. 14. Natalie Sterling in Not That Kind of Girl, wants to be in control and have everything perfect and under her expectations. Is that a reflection are part of your personality or just the character you created? That is definitely all Natalie and no Siobhan. I'm too scatterbrained and disorganized to exert any control over my life. But I will say that I think Natalie's drive to succeed feels like a part of me. 15. One of the greatest strengths in your books are the characters, they are so solid and believable. The characters you create, are they reflections of people you know, composites of different people you know or entirely your creations? This is such a nice compliment, because I feel like character is always the weakest link in my writing. But I personally tend to try and avoid the "Real People" trapping, because those characters always seem the least real in my stories. Weird, right? 16. You have a professed love of music, many authors today blog or publish a playlist either as recommended listening for a novel or music that was used while writing or editing. Do you find you end up with soundtracks while writing specific books? Have you considered sharing them? I did have a sound track for Same Difference, which I published on my old site. But lately, I have trouble listening to music and writing. I get too distracted. I've been listening to Thunder and Rain lately. It's hilarious. It will be completely sunny and bright outside my office window, but the rain is pouring down on my desk. Alas, I have had zero film / television interest. I think the problem lies in that my books are not at all High Concept. They are just real girls in real situations, and I think that's a hard sell for Hollywood these days. 18. You just recently finished a manuscript can you give us a few hints about this new story? Ah! I am SO NOT FINISHED! Actually, I just got my revision letter back and I've got an insane amount of work to do! But the book is about a list of the prettiest and the ugliest girl in each grade of a high school, and the story follows those eight girls for one week in their lives. Hmm. Both of Melissa Bank's novels (2), John Updike's Rabbit novels (4, and I'll pass on the short story where Rabbit dies), Blankets, The Portable Dorothy Parker, The Chocolate War, The Great Gatsby. You can make a living doing what you love. I swear. Just be ready to embrace the hustle. Siobhan Vivian, thank you for taking the time to answer some questions for us, and thank you for the awesome books. 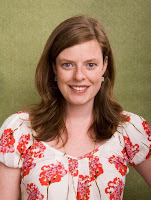 Author Profile interview with Siobhvan Vivian. This story is written in a Russian or Eastern European Fairy Tale style. In some ways, for older readers, it will be reminiscent of Jerzy Kosinski's The Painted Bird. The story at times is dark, charming, and wistful, and at all times it is extremely entertaining. This debut novel will leave its mark on the reader, much as Kate's knife leaves her marks on wood. For Kate is a wood carver; she is not yet in the guild, but her father is a guild master and it looks like it will only be a matter of time before Kate is a master also. All that is holding her back is her age. But then tragedy strikes - her father falls to the witch fever and passes away. The new guild master expels her from the only home she has ever known. She takes to sleeping in the bottom drawer of her father's stall in the market. She ekes out a living on the slight generosity and tolerance of the town. Yet soon a white witch comes to town. He has power and he stirs up trouble against Kate. She finally agrees to his demand and sells her shadow. Kate soon realizes she cannot live without her shadow and she needs to find out what the stranger Linays wanted it for and if there is a way she can stop him. 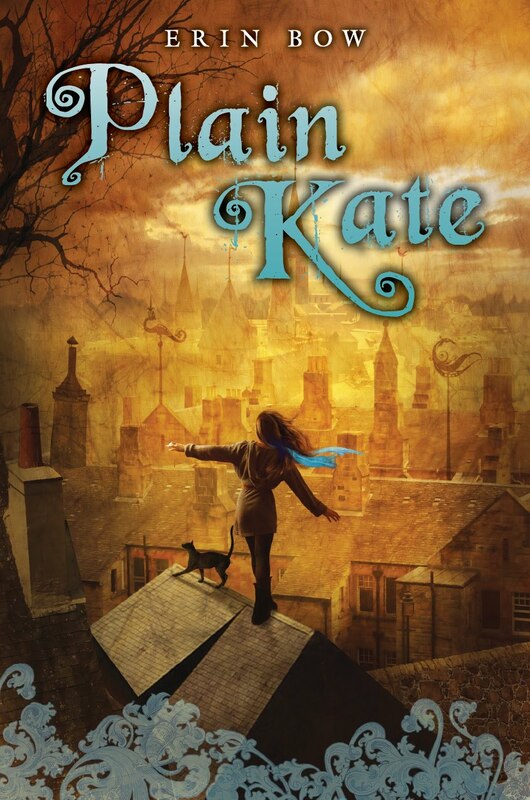 In a world of superstition, curses and cures, Kate must find her way alone and lonely. The story is compelling and the readers will find themselves not wanting to put the book down. The world created by Erin Bow is familiar to tales of old, with a young woman coming of age and finding her place in the world. It is an amazing story that is very well written, especially for a first novel. Erin Bow is a particle physicist, who formerly worked at both CERN and Los Alamos labs, who has now become a poet and author. She resides in Kitchener, Ontario. She has written two volumes of poetry, and now a novel for young adults. Erin will be giving a lecture at UWaterloo on November 12th, titled Poetry for Physicists, 2:30-4pm EV2 room 2002. Her Husband James Bow is also a local author. 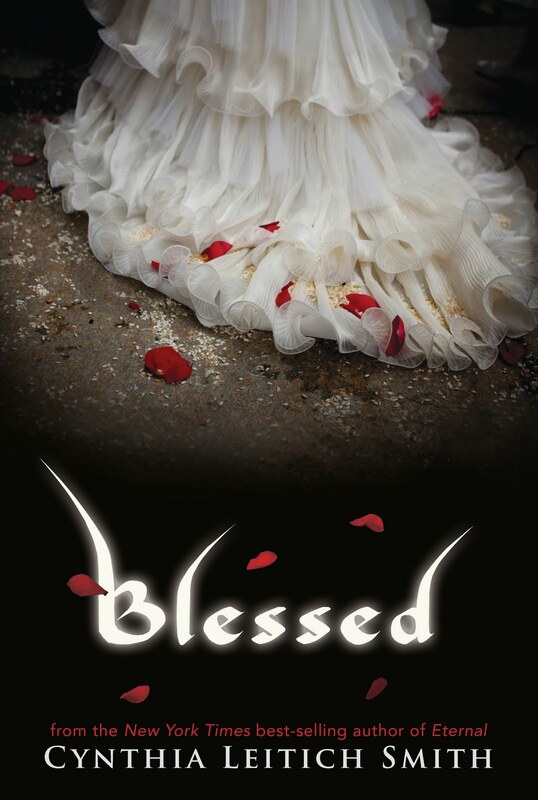 Enter to win an advanced copy of Blessed by Cynthia Leitich Smith. Courtesy Candlewick Press. The book hits book stores in January 2011 but you can have it early December. The contest runs from now until December 1st, the book will mail December 2nds so you can have it in time for the holidays. To enter, post a comment on this post, second ballad for following on me on twitter, third for retweeting the contest. Winner will be announced on December 1st, check back and email me you mailing address. Contest open to North America and UK. This much anticipated book ties the stories from Tantalize and Eternal together in a wonderful new story. It had been a few years since I read a book by Peter H. Reynolds, when his book Ish came to mind. I tracked down some of his newer books and was really impressed with both the stories and the illustrations. 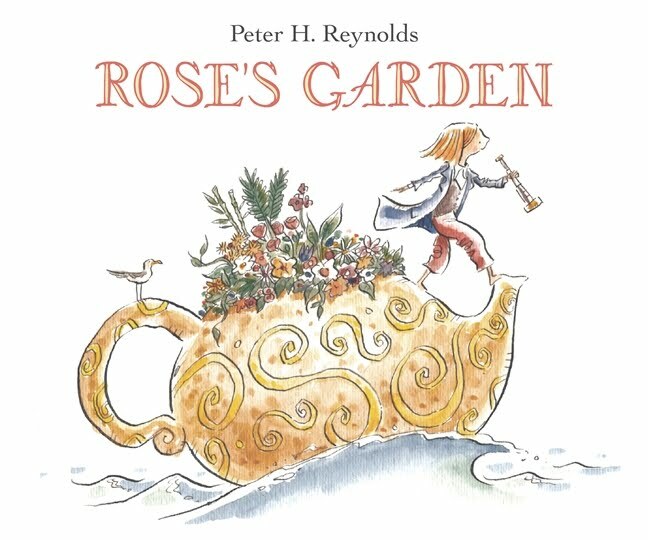 This is the story off a young girl named Rose; she is sailing around the world in her teapot ship and she collects seeds where ever she goes to remember the places she has been. Soon she arrives in a new town and decides to settle there. She finds an abandoned plot of land and decides to plant her garden. But when she returns to her boat, almost all her seeds have been eaten by birds. She takes the few that are left and plants them, and waits and waits. She hopes and believes that the garden will grown and bring color to the city. But the plants just do not seem to be blooming. Then one day a child brings her a paper flower for her garden - soon all the children are bringing her flowers and her garden becomes full of beautiful flowers. Then she realizes that there are real flowers growing among the paper ones. Her faith has been rewarded. Reynolds has a very distinctive style of illustration, often minimalist, in that there are drawings in the center of each page without having to cover every page from edge to edge. The artwork is adorable and the story is wonderful. In this story a young boy is learning about life - first to crawl and then to walk. But soon a cat is telling him he must hurry up as he is falling behind and will lose his way. He starts following all the signs, even when they become very confusing and often contradictory. Soon his life seems like a chore or task to stay on the path and stay caught up with others. But all along he is becoming less and less happy. Then he wanders from the path and starts to find an enjoyment in nature again. 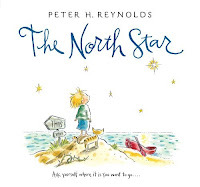 It had been a few years since I read a book by Peter H. Reynolds, when his book Ish came to mind. I tracked down some of his newer books and was really impressed with both the stories and the illustrations. I love Reynolds, who has a very distinctive style of illustration, often minimalist in the extreme with just a small drawing in the center or each page without having to cover every page from edge to edge. The artwork is adorable and the stories always wonderful. 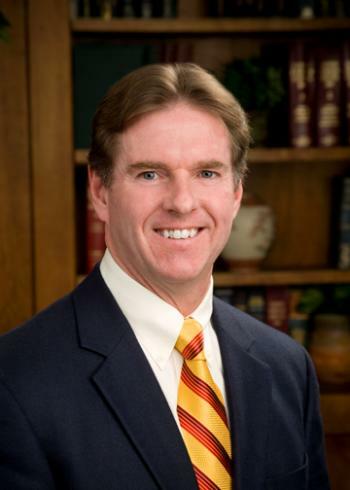 Dr. Kevin Vost, a modern renaissance man. 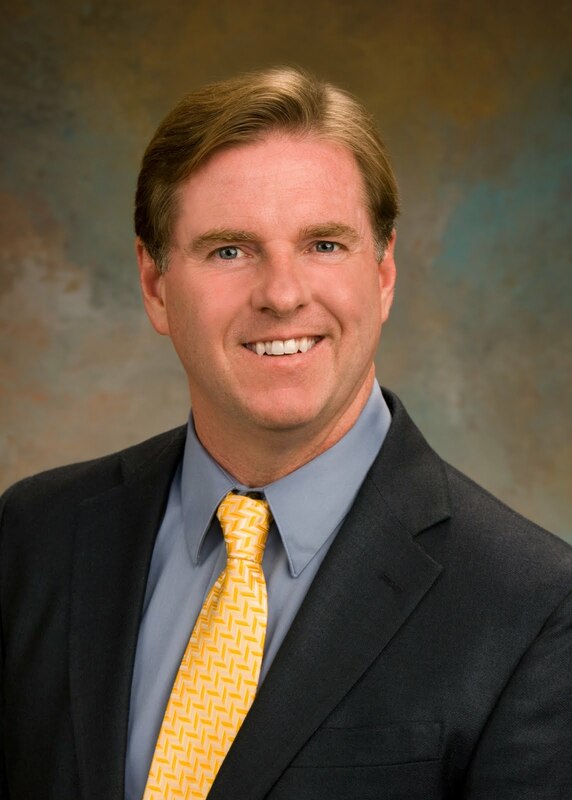 He has taught Psychology, a research and review committee member for Mensa. Strength trainer and exercise master, with over 40 years experience as person trainer and competitive weightlifter. . A man who seeks to balance body, mind and spiritual development and help others find that same balance. We at Book Reviews and More thank him for taking the time to answer some questions. 1. In many ways you are a modern renaissance man, body builder and fitness expert, Doctor of psychology, educator, researcher, student, author and more. Very few people today are as well rounded as your are to what do you attribute this? Well, from my earliest memories as a child, I was really into superheroes, especially Superman. In my early teens, my idols were Mr. Universe winners and world champion weightlifters. In my later teens, I developed a fascination with philosophers and great thinkers like Aristotle, the Stoics, and other great Greeks and Romans. By my mid-forties, though I didn't see it coming, I was ready to get theological, if you will, and I became fascinated with the lives of great saints. So, my areas of interest have been body, mind, and soul -- and those three cover a lot of ground. When we strive to fully develop them, it puts us in the best position to most fully experience and enjoy this fascinating universe we've been given. I've sought to learn from the very best from whatever period of history, and to seek out practical ideas that can be applied in daily life. So, if I'm well-rounded, then I owe it to all the bodybuilders, philosophers, theologians and saints who have fascinated and inspired me. 2. You write such varied book, from body building to memorization, development of faith, and biographical. Few authors span such diverse topics, to what do you attribute your success in such different fields? 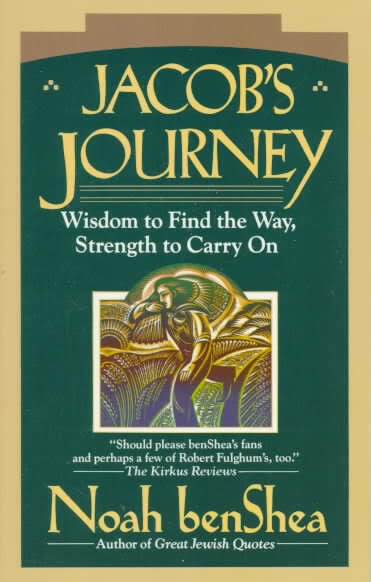 Whatever success I've had probably comes from trying to model (or at least mimic) some of the very best thinkers of ages past, like Aristotle, St. Albert the Great, and St. Thomas Aquinas, and a few from recent times, like Arthur Jones and Mike Mentzer in the field of strength training. Some of the lessons I've learned from the ancient thinkers include the recognition of the great thinkers who have come before us. We should never start from scratch on a subject, but make ourselves aware of the great contributions that have come before us so that we may or may not find something to add, or hone, or tweak, or apply to some new situation - rather than reinventing the wheel - or perhaps reinventing some square-shaped thing of old that didn't roll too well. I also try to share in their search for broad, integrated knowledge, trying to see the "big picture" and the interconnections, rather than becoming too narrowly focused on one thing. At least I try, that is. 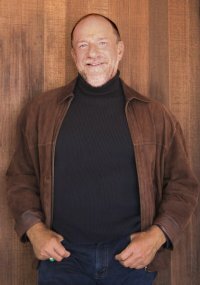 I'm also intrigued by the concept of virtues as perfections of our human powers, and I strive to find fun and effective means of perfecting those powers, be they the memory improvement techniques developed by the ancients and medievals or the high intensity strength training techniques pioneered by people in my own lifetime. Yes, especially a couple of swivel rockers in the living room, our coffee pot, and "Colossus Maximus." Colossus is the name of this huge, over 8 foot long oaken desk/bookshelf that fills my study. I had it built for my writing and reading. Its decorations include a Roman helmet replica, a Greek vase painted with scenes from the Iliad, a bust of Poseidon, statues of Augustus Caesar, The Virgin Mary, St. Thomas Aquinas, and more. These mementos are among my daily reminders to try to strive for the best. I'll explain the rockers and coffee in the next answer. I'm an early riser, about 4:30 with no need for an alarm clock. I start usually with a quick perusal of my email in my study and then I move to one of those swivel rockers with a hot cup of coffee in one hand and a good book in the other, and with classical music going softly in the background (Anton Bruckner being my favorite for reading.) This way I start every day rested, relaxed, and fired up with good ideas. My work hours at the disability office are 7:00 - 3:30 PM, so it leaves me with a fair amount of free time in the evening until I conk out around 9:00 PM. As for my weekly routines, in terms of fitness, I run with a couple of wonderful ladies from my office every Saturday and Sunday morning, usually about 5 or 6 miles. My wife Kathy and I will then get to a gym, usually twice a week after work. One day I'll do a brief 20-minute HIT strength workout (mostly just upper body these days - my legs are a strong point and are well-maintained by running and biking) and then do about a 35-minute interval session on an exercise bike and the other day I'll just put in 40 or 45 minutes on the bike. I alternate between traditional and recumbent bikes. Oh, just this week I bought Kathy and myself an outdoor tandem bicycle for our 26th anniversary. We'll be working some leisurely rides into our fitness routine as well. (And if I tire out, Kathy can just get peddling and make up the slack!) Of course, Mass is also part of our weekly schedule. We usually go at 4:30 PM on Saturday and then out to dinner. When I retire in a few years I hope to make daily Mass a part of my routine. 6. What does your writing process look like? Takes us through the steps from idea to publication? Now this has varied a bit from book to book, but here is the general game plan. I'll have a idea from who knows where and I'll try to come up with an overarching theme and organizing principles. For example, for Fit for Eternal Life, this special organizing theme was the use of the virtues. In my biography of St. Albert the Great, I broke his life of many roles up into three parts labeled "Thinker, Doer, & Lover" and a special theme was the way he displayed the virtue of magnanimity - "greatness of soul." (He's Albert the Great after all!) I'll usually generate a proposed title, table of contents, introduction and at least one chapter and then email it off to a potential publisher. If they like it, it usually takes me 3 - 4 months really going to town to craft a first draft of 200 - 250 pages or so. I work in a disability office full time, so this is early morning, evening, and weekend work, though sometimes I'll take an afternoon or even a couple of days off if things are really rolling with my writing. A few months go by and the revisions start coming back from the editor. These I can usually finish pretty quickly, in a matter of days or weeks, depending on how fast they get things back to me. Usually after I've made my last revisions, a book pops out of the publisher's headquarters a few months of so after that. Then I start contacting the folks in Catholic radio and TV, and happily, they sometimes respond or contact me themselves! As I refresh and prepare for radio interviews and now, live talks, I try to come up with new twists and angles, so my learning on a particular topic continues long after the book is published. 7. Nearly all of your books are with different publishers. Some authors write for the same publishing house their whole career, and yet you seem to have good relationships with all of your publishers. How do you account for that success when so many fail in that arena? My first three books were with Sophia Institute Press. My fourth book on my reversion story was done with Our Sunday Visitor. The reason was that Sophia was going through some restructuring of sorts and it was taking such a long time for Unearthing Your Ten Talents to come out, that I figured I'd try the idea for From Atheism to Catholicism (which I'd initially proposed as Theology for Atheists) on Bert Ghezzi at OSV and it worked out very well - and very quickly. Those two books were published within a month of each other this year, though Ten Talents had at least a year head start! My fifth book on St. Albert the Great will be with TAN books. Why? Well, it just so happened that Todd Aglialoro, my Sophia editor, now works at TAN. St. Albert is our fourth joint project. All of these publishers have been very good to me and, those publishers and the good Lord willing, I hope to work with every one of them again. In fact, I'm in a project with a fourth publisher too. I'll discuss that in a later question. Oh, as far as my success with multiple publishers, it may have to do with the fact that I can't rest easy with a project afoot, so I work fast and get them what they need when they need it!I also very much appreciate what my editors and publishers do, so I very much try to promote all my books with as much radio, TV, live talks, articles, etc., as I can muster. I also hope that any attention any one book gets helps draw attention to those with the other publishers. I imagine these Catholic publishers see it is to their advantage for them all to stay strong. They are ultimately on the same team! 8. I once had a university professor state that the true goal of a university education should be to teach one to learn how to think. What would you state should be the goal of higher education and why? I like that statement as long as we realize that to teach the proper thinking methods we also need to pass along a very healthy serving of content, providing a broad and vast knowledge base upon which we can then pass our judgments. In my book on St. Albert, tentatively subtitled by the publishers, by way, The Last Man Who Knew All There Was To Know, I point out how the ancient "trivium," (literally, three ways) formed the basis of classical and medieval education. By studying grammar, logic, and rhetoric, students learn in depth how to reason logically, see through propaganda and false arguments, and to express their own thoughts clearly in writing and in speaking. So, I'd say the goal of higher education should indeed be how to teach one to learn how to think, building upon a knowledge base of the thoughts of great thinkers before us. You might guess from this that I'm also a fan of "great books," and I see that later questions are leading us there. 9. You write about topics many would prefer not to year about these days, discipline, virtues, obedience, and personal responsibility. Yet even with writing about such unpopular topics in our culture and even in the church in North America, you are developing an ever growing fan base and popularity. Would you consider that a result of people realizing what the need? I hope you are right about that Steven, and hopefully this may be one reason why people are receptive. In his book, The God Delusion, Professor Richard Dawkins wrote that Christian writers are all about "sin, sin, sin, sin, sin, sin, sin." If I recall correctly, he wrote sin seven times for emphasis (perhaps playing too on the 7 capital or deadly sins.) Well, though this may be the emphasis of some Christian writers, I tend to focus most on things like virtues, the opposite of sins or vices. Sin and vice make us less than we are, but virtues make us all we can be. They perfect our powers and they lead to true happiness. So, I think people are receptive to the idea that by reading "religious" books we can find out things like how our intellects operate, how to develop very powerful memories, how to become very physically fit and strong, how to become kinder, and happier. These are the kinds of ideas that I've borrowed from great saints and theologians. I'm just trying to pass them along as a very nice alternative to some of the much more harmful, but also more boring and mundane alternatives (in my opinion anyway) given by modern pop culture! I am so impressed by great writers of fiction, but I'm just not sure my mind works that way! 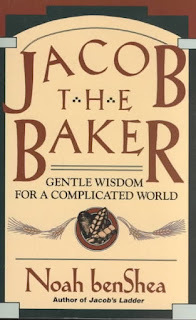 I love historical fiction and have toyed with ideas like a St. Thomas Aquinas or an Epictetus popping up in our modern world kind of scenario, but God only knows. Not in the near future, but perhaps after I retire? 11. What books are currently in progress for you? Writing, researching, planning or even just ideas that you would like to work on? I have just finished the St. Albert book for TAN which is due in March, 2011. I'm also to be featured in a chapter of a book on Catholic reverts by Lorene Duquin due the same month from Our Sunday Visitor. I'm also on the brink of formally proposing a book to TAN called Three Irish Saints: A Study in Spiritual Styles which will feature Sts. Kevin, Patrick, and Brigid, and include self-assessments for tendencies towards deep thought/devotion, action/evangelization, and interpersonal charity/mercy, with the goal of helping us grow these capacities within ourselves. I also want to write a book on St. Aelred of Rievaulx some day and a follow-up memory book -- The Catholic Art of Memory. 12. Do you see yourself return to the fitness industry and writing another book for physical development? Absolutely!! In fact, your timing couldn't be better. At Cheryl Dickow of Bezalel Books' suggestion, Peggy Bowes, the author of The Rosary Workout, and I have also started just in the last couple of days a new book of 365 daily devotions of faith - and fitness. Each day will include spiritual meditations and also practical tips on nutrition, rest, strength training, cardiovascular training, stretching, etc. So, with Peggy and Cheryl's collaboration, I'll be racking my brain and pulling out all the stops to provide all sorts of practical tips and suggestions on improving the body for just the right reasons. Also, we are hoping to produce a joint exercise DVD next year, possibly in collaboration with Johnnette Benkovic of EWTN TV's Women of Grace Program. Oh, and I'll also have a new article on Faith and Fitness in the May, 2011 issue of Liguorian Magazine. 13. What authors influenced your writing style and format? The one influence I'm most conscious of was the popular historian Will Durant. For example, I remember in his book, The Pleasures of Philosophy, he was writing about the pleasures of family life when he wrote that right at that moment he heard his young daughter downstairs calling up to her daddy. He wrote as if he were sitting there chatting with you. 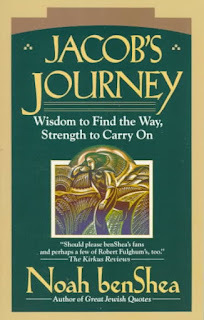 He focused on weighty things like history and philosophy, and he wrote like a real human being, living a normal life in our day, and hoping to share with us the great lessons in life he'd learned from others. I'm not saying I can do that, but he was one of my models. An ancient author whose style I greatly admire is the Roman Stoic Seneca. Just read one of his Letters and you'll see what I mean. 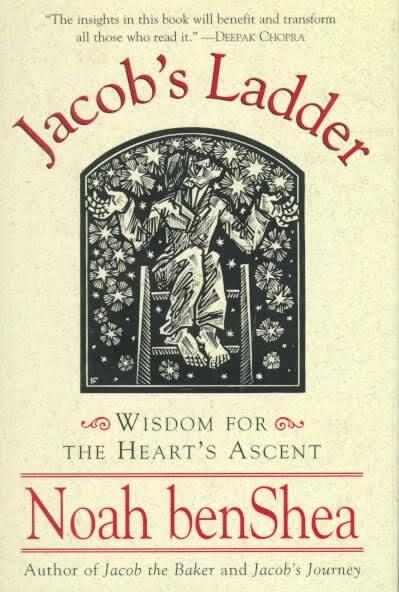 He also influenced me personally in 2004 by one of his great lines, translated from the Latin - "There is nothing the busy man is less busied with than living." Now, having been a very busy person, this really stuck me and motivated me to quit my adjunct college teaching. Having more time for reflection, within a year I found myself rejecting 25 years of atheism, returning to Christ and the Church, and becoming an author. (Thank you Seneca!) In terms of format, I think I've also been influenced to some extent by the modern philosopher Mortimer Adler. Being an Aristotelian and a Thomist, he always strove and succeeded in being very clear, organized, and logical. I give it my best shot.14. If you could only recommend 10 books to a reader looking to be a well rounded and whole person what books would you suggest? The Bible St. Thomas Aquinas' Summa Theologica Aristotle's Nichomachean Ethics Epictetus's Discourses Seneca's Letters Marcus Aurelius' Meditations Thomas a'Kempis's The Imitation of Christ H.D.F. Kitto's The Greeks Mike Mentzer's Heavy Duty II (strength training) Kenneth Cooper's Aerobics These are heavily weighted towards philosophy and theology, and especially ethics - how to relate to God, to regulate oneself, and to treat one another. If those areas are developed, everything of importance will tend to follow along nicely. 15. What fiction books or authors do you enjoy or recommend? I don't read much fiction, though I prefer historical fiction and love it when I read it. In my youth, I loved Ayn Rand's novels, especially The Fountainhead - "Man's mind is the fountainhead of achievement!" I've enjoyed the Claudius novels by Robert Graves too. I much like the fictional novels on saints by Louis deWohl. His The Quiet Light on St. Thomas is a favorite. Eagle in the Snow by Wallace Breem about the last days of the Roman Empire was a great read a few years back, as was Angels in Iron by Nicolas Prata about the Knights of St. John's defense of Malta. My editor Todd Aglialoro got me into the various and hilarious Jeeves books by P.G. Wodehouse a couple of years back, and those are a lot of fun. 16. What fitness authors to you recommend? Anything by Mike Mentzer, Arthur Jones, Ellington Darden, or Clarence Bass. (Clarence has a very popular web site at www.cbass.com and I've written several articles for him myself.) These are the masters of HIT - high intensity strength training. I like Adam Zickerman's Power of Ten book on the super slow method of training too. I also recommend highly my friend and co-author Peggy Bowes's The Rosary Workout for a wonderful graded program of aerobic exercise and prayer. Hmm? Should I reveal this? I watch very little TV, mostly EWTN, and my favorite show is The Journey Home with Marcus Grodi. (In fact, plans are in the works for my own 2011 appearance! Please pray for that!) However, Kathy and I also watch Dancing with the Stars, and well, Big Brother. We like the elegance, the discipline, and some, though not all, of the humor of Dancing. Big Brother is the kind of thing I would never have chosen on my own, but a friend strongly recommended it and I finally acquiesced. I've found it an interesting experiment in social psychology, a good way to keep up with the behavior of modern young adults (not that what goes on in that show is always typical! ), and I've been pleased to see, that even in that game, nice guys (and gals) who are honest and kind, often win! Oh, I don't seek this out, but when I happen to chance upon a World's Strongest Man competion, I always enjoy those and find them inspiring for training! Still, I usually just watch a little TV when I'm too tired for reading or writing. I also like superhero movies - Superman, Ironman, X-Men for example, though Kathy and I very rarely go to the theatre for modern movies. We do love to watch the old Turner classic type movies with people like Errol Flynn, Audrey Hepburn, John Wayne, Clint Eastwood, Gary Cooper, etc., usually on Friday nights. I'm thinking maybe it was Chesterton who once answered a question like this with How to Build a Boat. Actually, see #14, except I'd forgo the Aerobics book and bring along The Catechism of the Catholic Church. 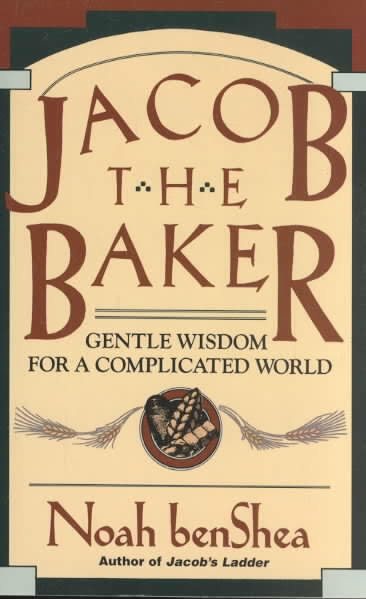 It's an amazing distillation of the wisdom of great thinkers (Augustine, Aquinas, and others), as well as Scripture and the most important parts of the 2,000 years of tradition within the Church. Thanks so much for asking me these great questions Steven. Readers may also contact me through my web site at www.drvost.com, if they should be so inclined. Thank you again Dr. Vost for taking some time to answer our questions. I found them fascinating and am sure many others will also.